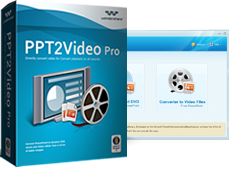 Wondershare PPT2Video Pro is a powerful tool designed for converting PowerPoint to AVI (Audio Video Interleaved) and other popular video formats retaining the original animations, transitions, video/audio clips. With this PowerPoint to AVI converter you can view PPT files with media player on computers without PowerPoint program installed. Share PowerPoint presentation on computers without PowerPoint application installed. Played the AVI presentation on mobile devices, such as Blackberry and Pocket PC. Convert PowerPoint courseware to AVI for online sharing. Study on the move with portable devices like iPod by presenting PowerPoint as AVI. Practice and review your presentations on computer or on portable video player. Extend the utilities of PowerPoint for online marketing. Show detailed reports, surveys and studies on any subject or domain with PPT. Train your employees on Web with PowerPoint courseware in AVI. Convert PowerPoint photo slideshow to AVI for sharing it on Web. Learn about places of interest on your iPhone as you travel. Use PPT to communicate with the word for the need of action and help.